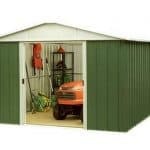 This large based shed is ideal for those who are serious about their gardening, as it can store all of the items you’ll commonly use while still having room for soil, sand and aggregate, or even a ride on lawnmower. It has to be said that we would have preferred the roof and eaves to be a little higher, however, so you’ll probably have to stoop down when going in and out. A metal shed is only as good as its cladding, so we were pleased to see that the steel gore had been hot dip galvanised. This gives the zinc plated finish which is most noticeable on the door, gables and roof as opposed to the green painted walls. Galvanised steel is very water and rust resistant, a defence that is also helped by the apex nature of the roof. It’s why a 12 year warranty is provided against the eventuality of rust perforations. Another feature that we admired was the inclusion of an anchor kit with rust free screws, which is not always something we find provided as standard. It means that the shed as a whole won’t be let down by rust appearing at its base, and shows the attention to detail that gives this garden building added value. You might also like to see the top 20 yardmaster sheds currently on sale in the UK by visiting the WhatShed yardmaster sheds awards league table. We liked the green and off white colour scheme displayed on this metal apex shed, and it fulfills two functions. Firstly, it adds an extra protective layer that helps to keep rain out of the interior, and secondly it creates an attractive appearance that blends in nicely with a garden background. If you’ve been put off by the plain look of silver coloured metal sheds, you might find this much more to your taste. There are also two benefits to the apex roof which tops this garden building. It’s excellent at repelling rainwater, which simply bounces or rolls off its surface, and it also adds a little more vertical space. This is much needed, as the shed has a ridge height of 2.02m, in itself quite reasonable, but a restricting eaves height of just 1.63m. 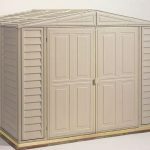 At the opposite end of the scale, the overall width of the shed is 3.03m and the overall depth is 2.98m, so your chosen base will need to at least match these generous dimensions. The metal cladding is quite lightweight and feels thin, which is something that we often find with metal sheds in this price bracket. We were pleased, however, to find that once assembled it creates a solid and dependable structure. This is because of the strengthening effect that comes from the use of hot dip galvanisation. It’s a process that bonds zinc to steel,so although the metal itself is still thin it becomes very tough. No flooring is provided, but one thing we were pleased to see was the inclusion of an anchor kit. These rust free screws mean that the shed can easily be attached onto a suitably sized and suitably level concrete surface. Thanks to the rain repelling apex roof and the very rust resistant nature of galvanised steel, we would expect this shed to remain free of corrosion for many years to come. That belief is backed up by the 12 year warranty provided by Yardmaster against perforations resulting from rust. 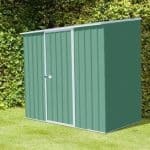 Whilst we review some metal sheds that are covered by 20 year warranties, 12 years is still two years longer than is supplied with some metal sheds, including some others in the Yardmaster range. As is common with all metal sheds, there is no requirement for treatments to be carried out by the owner. The double doors stand out on this shed, and not only because of their contrasting cream colour. We were impressed by how wide they were, measuring 1.20m. This makes it easy to carry wider objects in and out, particularly if the wheelbarrow available as an optional extra is used. We were less impressed by the height of the doors, at only 1.58m most people will have to bend down to get through them. There is no window supplied with this shed, so you may want to add an artificial light source, although the white walls light up the interior when the doors are opened. We liked the fact that the doors are fitted internally, as this is one of two important and inbuilt security features. It means that the doors can’t simply be lifted off of their rails, and so makes it harder to gain unauthorised access. The lack of windows can also help in the fight against shed crime, by concealing any items of worth that may be kept inside. One way in which security could have been improved, however, is with the addition of a padlock. It’s a pity that one wasn’t included, even though the handles have been holed in readiness for one. As well as the wheelbarrow mentioned earlier, a Bull Picador in a matching green colour, there is also the option to add a water station, which we imagine will be popular with shed owners who are keen to reduce their carbon footprint. There is also an optional tool rack on wheels, and a four shelf racking unit measuring 2’6 X 1’8. We especially recommend this extra to people looking to make the most of the vertical space that’s available. Yardmaster are famous for the high quality of their sheds and components, and we found this to be well deserved, with even the screws being galvanised. Despite the thin metal cladding, once assembled this is strong and durable, so should be able to withstand the extremes of our climate for many years. As long as you don’t want to store tall items then you’ll be able to fit a lot into the storage space available. We did feel, however, that the low eaves height slightly lets down the accommodating width and depth. There are lots of components, but it was good to find that they are all labelled correctly and that the instructions were not too difficult to follow. We also appreciate the inclusion of a pair of gloves, which is a useful addition from a health and safety point of view. With a friend’s help, you should be able to install this shed in approximately five hours. 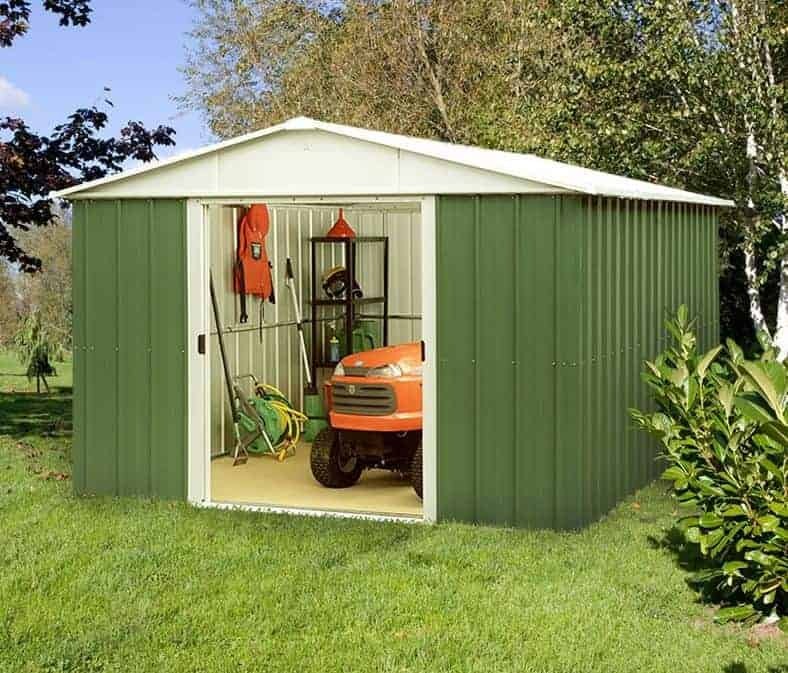 We feel the value for money would have been even higher if there was more vertical space available, but even so this is not overpriced for a high quality metal shed. Final Thoughts: If you’re looking for a wide based metal shed that will fit in with a traditional garden, then this is well worth your consideration. We did regret that the headroom was on the low side, but for many people the height of a shed is a less important consideration than its width and depth. You’ll find excellent weather-proofing qualities here, helped from the top downwards by the apex roof which then leads on to the corrugated galvanised cladding. In essence, this makes it very difficult for water to reach the interior, so you’ll have confidence that your contents will remain dry. Yea I would go with a 10×10 if you liked the first Yardmaster.